A few clicks later and I learned that this new design was not your typical shawl/wrap pattern. Yes, the shape is considered to be one of the typical shawl shapes out there (a parallelogram, in case you're wondering), but what made it stand out to me? What made it become the pattern of my obsession ever since I laid eyes on it? Simply put: the wrap is knit solely from the mini skeins of an advent calendar. That's right, Ambah O'Brien's ADVENTurous Wrap was designed with a yarn advent calendar in mind! And trust me, this year I saw SO.many. advent calendars out there for knitters! But not only is this pattern great for using up those mini skeins from advent calendars, it's also a perfect way to use up all those leftovers that are taking up valuable space in your stash. I can honestly say that I'm always thinking about how I'm going to use up my ever-growing collection of minis and the leftovers that I refuse to get rid of. I've already come to terms with the reality that my Beekeepers Quilt will most likely never reach king size...or even lap size (at least not in the near future! ), so I've stopped collecting minis in the name of hexipuffs. 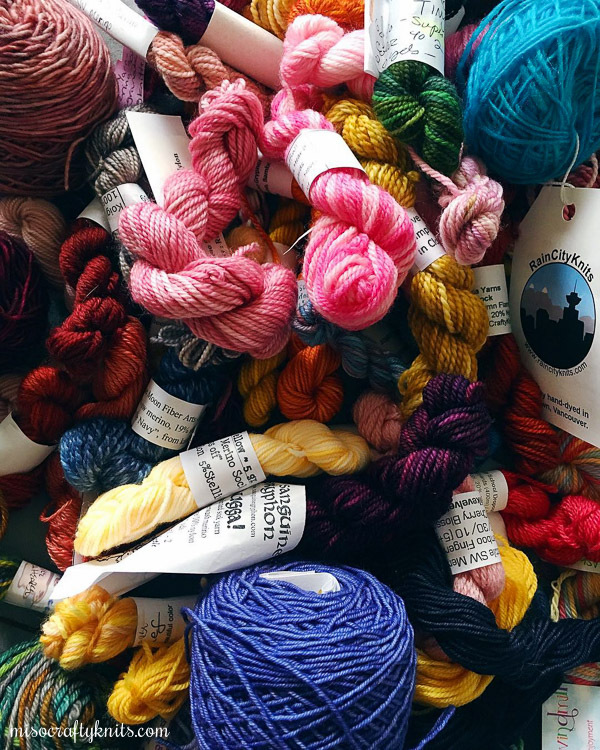 But what's a knitter to do with so many minis and bits and bobs? Now I know. This wrap is the answer. And I'm so excited and beyond obsessed. Now the hardest part, what colour scheme should I go with? Should I do a fade? Or should I simply use up the minis left over from last year's Opal advent and supplement with a skein of a tonal colour to make it all gel together? Luckily, I have a few things on the needles that I need to finish before I can allow myself to cast on this wrap, so I've got a little bit of time to think and figure it out. But I better make a decision soon...this obsession is starting to take over and it's becoming all I can think about! What do you think of the ADVENTurous Wrap? Do you partake in advent calendars? Chocolate, tea, or yarn? Speaking of which, I think I need all three of those things now! oh wow what a brilliant idea!! I haven't participated in any of the knitterly advent calendars yet, mainly because I feel like my stash in already insane, but those mini skeins look fantastic!